The Swirling Pin Wheels design is a counted Hardanger and Rhodes stitch needlework embroidery available in printed and Kindle formats. Over the past winter children from our town’s day care center stuck red and blue pin wheels along the edge of a nearby farm field. As spring time grass grew the March winds swirled the pin wheels bringing a bit of fun and joy to those of us driving through town. 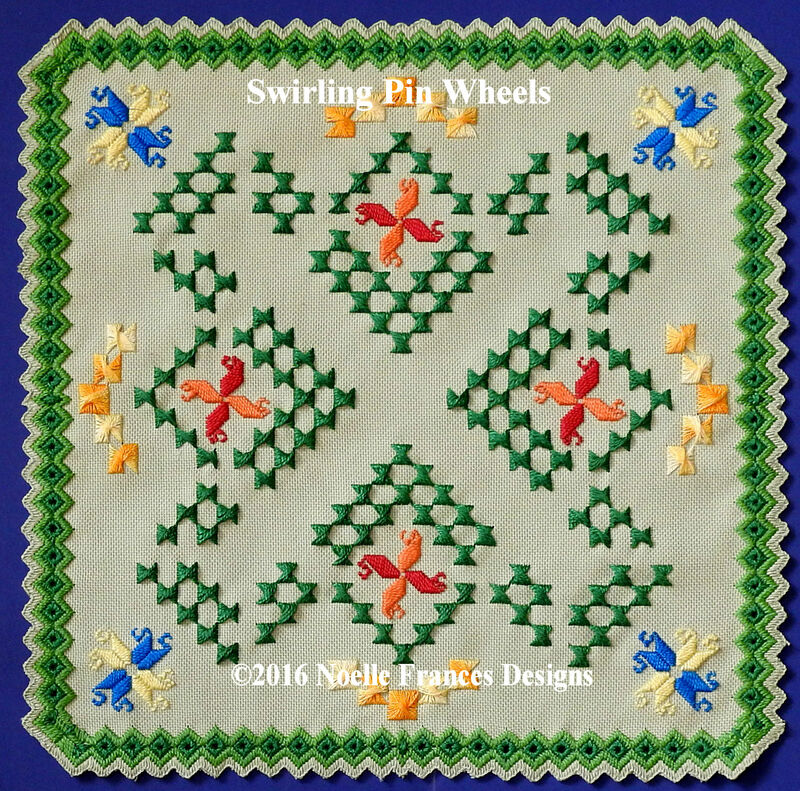 For the colorway of this design I selected variegated yellow for my sunny sky, bright colors for my pin wheels and vibrant greens to reflect the shades of the spring time meadow. There is no cutwork within this design. 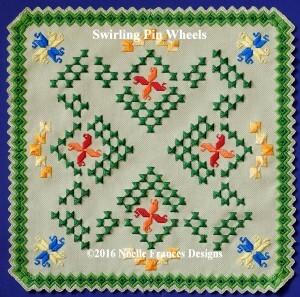 Swirling Pin Wheels design is 303 w by 303 h.
Worked on 22 count the finished size is approximately 14 inch square. My booklet Swirling Pin Wheels, 50-plus pages in length, is offered in e-booklet format and printed as a 8 by 10 inch paper bound booklet. Click the below photo for ordering or to access the Look Inside feature to view a few pages of the booklet for the Swirling Pin Wheels design.